I know I have dappled a bit into my fear of amphibians. My cowpokes will catch them and show them to me and I do my darnedest not to freak out. I fear that if they do know I am scared that one day they will throw one on me and then I will just die. I do not know what started my fear of frogs, but I really do not like them. I would rather have a pet tarantula then a frog. When I first moved to Louisiana my husband took me to his grandmother's house. We were having a get together for some reason. I remember my nephew holding a bull frog and chasing me with it. That bull frog was about a 10 pounder. I was so scared. I threatened his life if he touched me with it. I did not think it was funny. I do not mind dirt, mud, spiders, roaches, but frogs, they rank right up there with snakes. Let me show you all why these little frogs creep me out so much. Here they are. Just sleeping on my back door. This is how they get into my house. When I open the back door and run for my life onto the porch, they some how get in the door. Maybe it's because I leave it open because I am too scared to shut it? I will take the longer trip around the house and go through the garage, just to avoid them. I don't know if you can tell but there are six frogs up there. I was brave and moved the screen door. Two jumped onto the sliding glass door and the four stayed huddled together. I mean yuck. They just stay there. And they are everywhere. 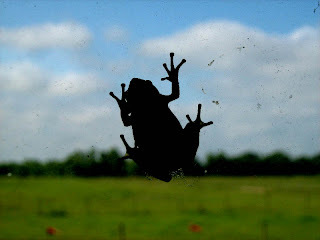 When I flip the top of the garage door key pad the frogs jump out at me. When I open the trash can lid they jump out at me. I am very jumpy when I have to open doors around here. This is frog number seven. He was hiding on the other side of the door. It gives me the chills to just look at them. They are very quiet during the day. But at night, those things are noisy. While we eat dinner you can hear them jumping on the window. It sometimes sounds like someone is knocking. And when they jump all around the leave their foot prints everywhere. It's worse than children's fingerprints. Well, a close second. I can't totally hate these frogs because they do eat bugs. But still they freak me out, with all their sliminess. Just look at their toes. Just imagine one jumping on your back while you are typing on the computer! *CHILLS* Oh, I do not like them Sam I am, I do not like green frogs and spam. Sorry I couldn't think of anything to rhyme with "am" that had to do with frogs. Spam is gross too. 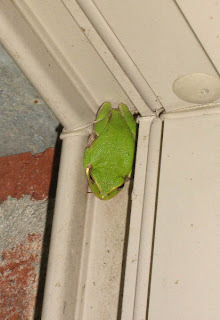 It is kinda like the green tree frog. Spam is slimy and cold, and makes funny noises. I bet it can turn great colors of green too. But, anyway, back to the frogs. These frogs get everywhere. Big Cowpoke found one in his bedroom. Little Cowpoke had one in his pocket. And I find at least one or two a week on my floor. But when I find them they look like this. This poor fella didn't make it. And he didn't make it into my vacuum. Little Cowpoke picked him up by his leg and took him outside for a proper funeral. If you count cremation by toddler's foot a proper burial. Just look at those legs. It's just not right. Speaking of legs, I do have to say that my cowpokes love fried frog legs. Gross right. But they will eat an entire platter of them. Me, I won't go near them alive let alone fried on my dinner plate. But I am all frogged out for the night. Are there any bugs or creatures that you are just scared of? One creature that just gives you the heebeegeebees (is that how that is even spelled?) But that is all for now, until next time y'all come back now ya hear! 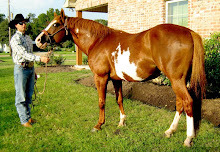 I am going to be posting my latest horse projects tomorrow. 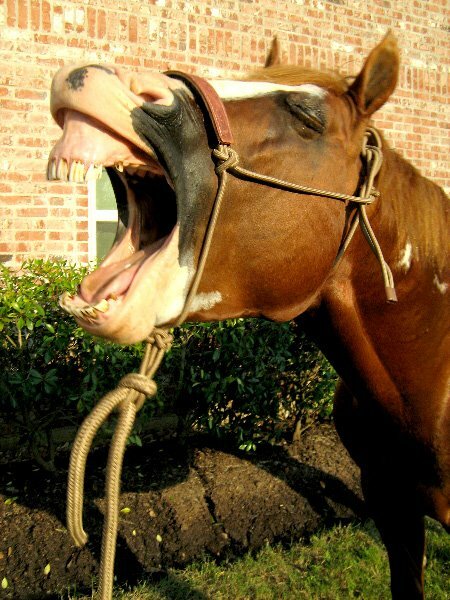 I love a good horse project. Andrea, I was laughing so hard! 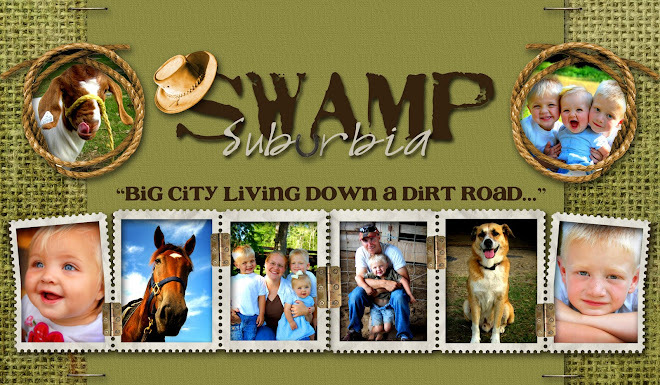 !I'm sure you saw my frog stories on my blog? Well, I have to agree, they are a little creepy (but still, kinda cute.) And slimy. But if they came into my house or hid in my door, I'm sure I would not think they are so cute! Now, I would take a frog over a spider any day!! Spiders are my phobia. I am even afraid to visit Australia because I have heard about the huge spiders there. I have learned to deal with them. But I am not happy when I see one in my house! I also don't like those giant crane flies because they have no aim and always head straight for you buzzing and all crazy....ugh! !...I could go on and on about creepies, I'll just stop now! Too funny! LOL! Well, look at it this way, start catching them and cooking them up for frog legs! Cheap dinner and maybe the word would spread that you kill them and they would quit coming! LOL! I guess mine would be spiders. Having said that I have 2 brown spiders that live in the barn, I leave them, they eat bugs! But when they come into the house I have to kill them! We sometimes get house spiders here and I have to get them! They really like to hide in the bathtub (not funny especially if I do not have my contacts on!) or in your shoes. Always dump your boots before you put them on! That is to funny. My daughter would be in heaven. She loves frogs. I don't mind the live ones, but I have to say, if I found one of those dead shriveled ones, I'd probably have issues with them too. But the spiders and cockroaches are much more yucky to me. Blech. Loved the story and photos. 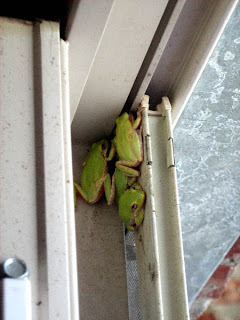 My hubby says the frogs are at the top of the door to stay away from the snakes! Could that be true? I don't really have a phobia of any creature. Snakes a little bit my son used to bring them home all the time and I would definitely be scared of Frogzilla. I saw you got a picture of him coming over the hill. Wow! I'll take all your frogs if you take all my spiders (and some of the ants too)! Also - I may ask you to throw in some of that Slap Ya Momma! I love frogs, but in sheer numbers like that I'd be freaked, too. I despise rats. And we have them. I wage war against them frequently and am currently out of rat cakes. 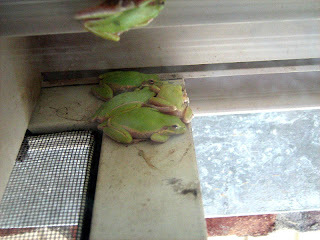 My stepmother is deathly afraid of these froggys too. I once watched her run in the house and curl up on top of the dryer for an hour after coming across a dead one outside. It was quite funny. Roaches are my thing. I can't kill em, cant look at em. I get nightmares about them. But when I was a kid my grandmother had roaches and they used to FLY right AT MY HEAD and I had to hide under the covers and scream for help. I'm going to have to show my son this post. He'll be so jealous and want to move "down south." We don't get near enough of those here in NM. As much as I enjoy frogs, I think I'd also be grossed out finding them all over. It has to be on MY terms! Good luck.